I also used the same dataset to make some static graphics using ggplot2 and the ggthemes package. I’d love any input on how to improve the the look and feel of both these and the Tableau viz. I’ve always found picking good colors very challenging, so thoughts on the palettes are especially welcome. 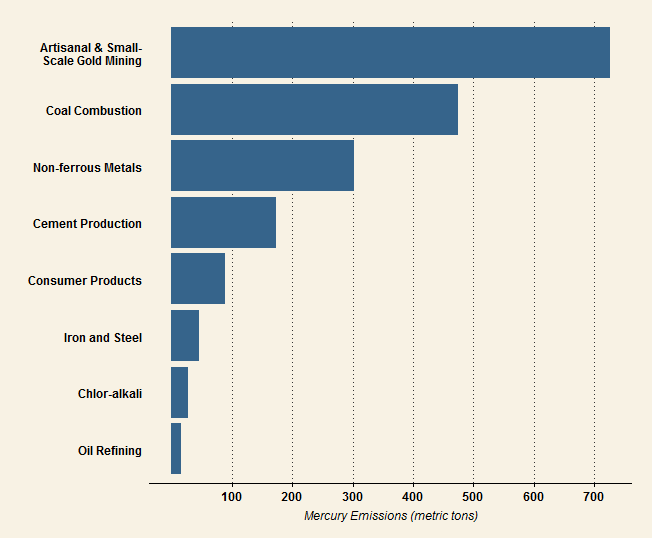 The 8 industry sectors with the highest global mercury emissions. Data for 2010 from the 2013 UNEP Global Mercury Assessment. Countries with the highest mercury emissions. Data for 2010 from the 2013 UNEP Global Mercury Assessment. How Much Mercury is in Your Favorite Seafood? I’ve written before about mercury emissions, mercury as a commodity, and mercury use in artisanal mining. But the reason we pay so much attention to mercury is because of its human health impacts, and these are primarily caused by eating contaminated seafood. Different types of seafood have different amounts of mercury. Because mercury is bioaccumulative, organisms that are higher on the food chain tend to have greater mercury concentrations. Of course, the particular environment where the organism lives also plays a big part. Scientists have been interested in the mercury content of seafood for decades. Recently, a group of researchers undertook the herculean task of aggregating data from almost 300 studies. The result is the Seafood Hg Database (and an accompanying paper). The database contains the mean mercury concentrations measured in each study for one or more of 62 seafood categories. Overall, the database represents over 62,000 individual measurements from around the world. It’s a great dataset to play around with and experiment with visualizations. In the graphic below, I plot mercury concentrations for a subset of common seafood types. Each circle represents the mean concentration measured in one study, and the size of the circle is proportional to the number of samples in that study. I’ve overlaid box plots for each seafood category that show the median of all the means, as well as first and third quartiles (whiskers go to 1.5x the IQR). I think this is much more instructive than simply plotting the grand mean (average of all the study averages) for each seafood category. For one thing, you lose a lot of information on how much mercury concentration varies within a category. Take tilefish, for example. This is one of the species that EPA and FDA advise pregnant women not to eat. But there are relatively few studies of tilefish, and the mean mercury concentrations they measured vary by an order of magnitude. For the last several weeks I’ve been experimenting with Tableau Public, a powerful, free software package for data analysis and visualization. I’m impressed by the software. It’s certainly the best free product I’ve worked with. 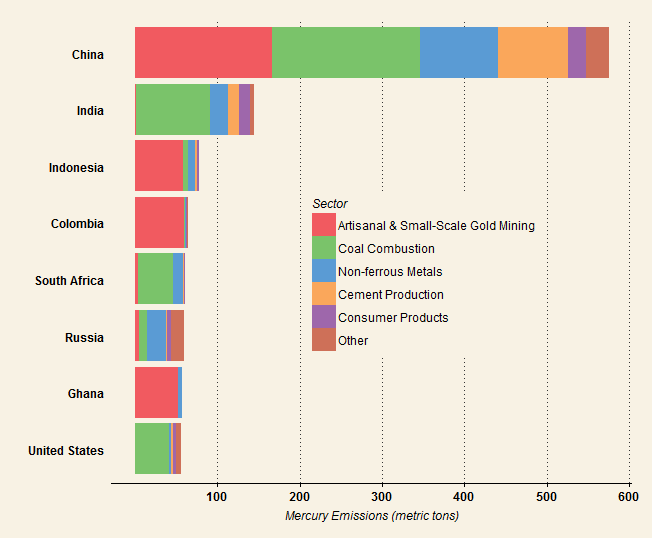 My big project on Tableau is an interactive graphic showing global mercury emissions by country and sector. I was able to get a nice dataset from the Arctic Monitoring and Assessment Program. These data were part of the 2013 UNEP Global Mercury Assessment. So they are very up-to-date, and with the adoption of the new Minamata Convention on Mercury, the topic is quite relevant. Good ingredients for an nice viz. The graphic combines three elements: 1) a world map showing mercury emissions by country in a color gradient scale, 2) a tree map showing the mercury emissions of regions and their constituent countries as a part of total global emissions, and 3) a bar graph showing the makeup of emissions by industry sector for the world or selected countries. All the elements are linked so that selecting objects in one changes the other elements.